Living in Columbus, when most people want to get outside, they go to one of two places: one of our Metro Parks, or to Hocking Hills. While I also enjoy both of these places, sometimes you just want to go somewhere a little more off the beaten path. Enter Wayne National Forest in southern Ohio. The area is more secluded than other places in Ohio and has two main areas: One near Athens/Nelsonville and another near Ironton. I actually did a backpacking trip to the Ironton location on the Lake Vesuvius Trail a few years ago on a misguided backpacking trip (you can read about that here). Another area to explore that is a little less hilly is the Wildcat Hollow trail. The trail allows you to do one of two options: the 17-mile backpacking trail or the 5-mile loop. The hike itself is fairly flat, but be forewarned, if it has rained in the past week, the trail will be extremely muddy. We did the hike last spring and I am pretty sure I am still knocking mud from my boots. There are also a lot of camping options on the 5-mile loop, so if you feel like doing a little dispersed camping without a lot of effort, this is a great option! The best part of the hike? We saw maybe 10 people the entire time. Try saying that about your hike in Hocking Hills! We chose to do the shorter 5-mile loop followed by a quick trip into Athens to enjoy food and beverages at Little Fish Brewing. Athens is about a 40 minute drive from the trailhead and a great college town with a few other breweries, eateries and Ohio University to check out. 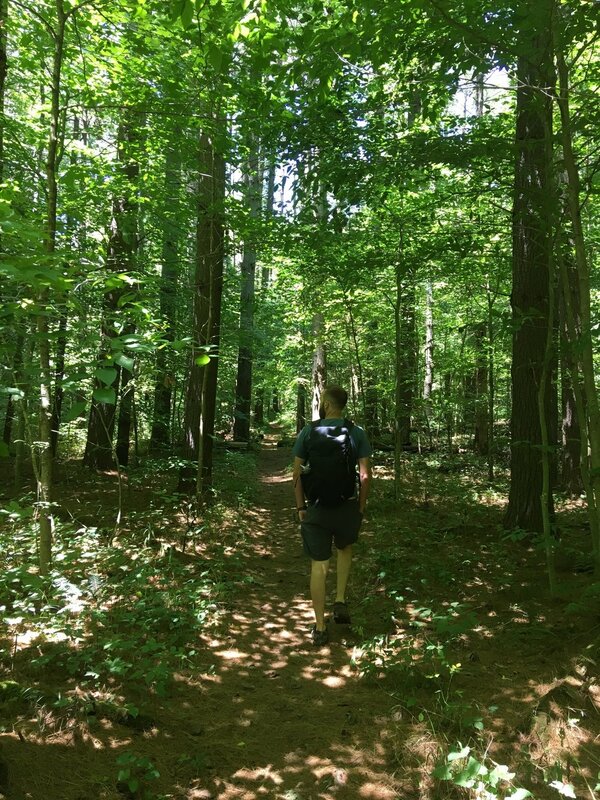 Check out Wayne National Forest and more of their hikes here. It’s spring hiking time – what are your plans? Let us know below!